The Bible says in Proverbs 4:26, "Watch the path of your feet, and all your ways will be established..." Are you watching where you are walking? If you aren't careful, you can feel ambushed as you fall into the traps of life. The devil is just waiting to trip you up with sins like adultery and greed. 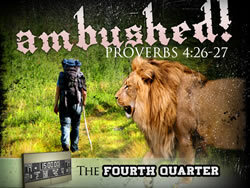 This message from Pastor Jeff Schreve's 7-MESSAGE series, FOURTH QUARTER, will help you get on the right path and avoid being AMBUSHED!